Josh sees Melissa in the Coffee Shop and thinks she's gorgeous. Melanie is suspicious when she sees Paul exiting No.22 via the side entrance. Melanie's secret admirer leaves a message on the answerphone. He has a dodgy foreign accent. Josh tells Todd that he's asked Melissa out - and she's said yes! Todd tells Josh that he doesn't mind him going out with Melissa. Jim comes in and Todd introduces Josh to him. 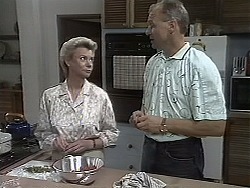 In the kitchen, Helen tells Jim that Beverly has called to say she's staying on at the hospital. Nick comes in and asks Helen for some wrapping paper for Josh's present. Jim says that he hasn't bought anything for Todd yet. 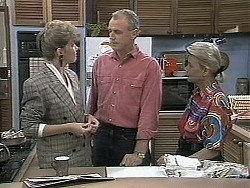 Nick suggests a computer, and Helen offers to chip in - after all, the whole family could use it. Toby and Sky are having eggs and chips for their dinner. Toby says he knows money is tight, but he doesn't mind as he really likes egg and chips! Joe comes in and says he's had a tip from a client - two tickets for an Elvis Costello concert tomorrow night. Joe says he'll arrange a babysitter for them. Beverly is rushing off to the hospital again. 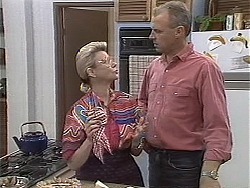 Helen tells her to make time for breakfast, but she tells them to stop fussing. Jim comes in and asks Beverly about buying a computer for Todd's birthday. She agrees and says she'll asks one of her patients which is the best one and pick it up on the way home tonight. Joe comes round looking for Des. Melanie tells him that Des can't babysit tonight as he's out at a business deal. Melanie offers to fill in. She even offers for the kids to stay the night. Todd wants to know what his birthday present from Jim and Beverly is, but Nick won't tell him. 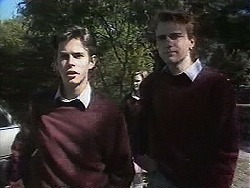 Todd goes over to Josh and Melissa who are standing together. Josh is oblivious to his discomfort. Melissa is clearly pining for Todd. Helen is putting the finishing touches to Todd's cake. She reminisces with Jim about the number of cakes she has made for the family, right back to the one she made for Jim before he and Anne were married. Helen tells Jim that Todd isn't very happy at the moment - the breakup with Melissa has upset him. JIM: Teenage broken hearts. We have more of those round here than we have birthday cakes. HELEN: That doesn't make them any less painful. Jim says that tonight's birthday dinner will cheer Todd up. Josh and Melissa are sitting together and Todd is sulking alone on another bench. Nick comes up and joins him, wanting to know why he's sitting on his own. He advises him to make up with Melissa, but Todd says it's too late. Melissa asks Josh how Todd knew he'd asked her out. Josh said he asked Todd and he said he didn't mind. Melissa grills him for further details. Joe and Kerry have arrived with the kids - Toby, Sky and Lochy. 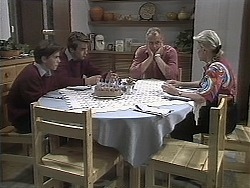 They excitedly sit down to eat the dinner Melanie has prepared for them. Joe and Kerry head off to the concert. Melanie and the kids chat about answer machine messages. Toby suggests recording a joke message for Joe later. Todd, Nick, Jim and Helen are waiting for Beverly who is very late. Eventually she arrives but stops in her tracks, realising she has forgotten about Todd's birthday. BEVERLY: Todd, I'm so sorry, I forgot. Jim's face is like thunder. The party has warmed up and everyone is singing Happy Birthday to Todd. He is chuffed and blows out his candles. Nick and Helen gives Todd some presents. Josh arrives and asks Todd for a private word. He tells him that he called off their date because she still likes Todd. He suggests that he gives it another go, but Todd doesn't think it will work. Toby is recording a message on the tape in a funny voice. Melanie plays them her mysterious message. TOBY: I know who that is! TOBY: That's Dad's mate Rocco, he's really funny! 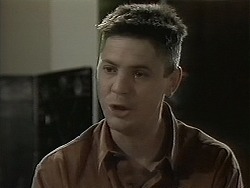 Toby assures her he's heard Rocco doing the voice before - Joe must have got him to play a trick on Melanie. Beverly and Jim are up late. He tells her off for concentrating on work over family. BEVERLY: I'll buy the computer tomorrow. JIM: Don't bother, I'll do it myself. That way I know it's done. Lochy and Toby are having a pillow fight. Joe and Kerry pop in on their way home for the concert and are appalled to see Toby and Lochy misbehaving. They apologise to Melanie and tell the kids off. 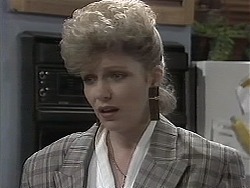 Melanie is quite tearful and tells Joe off for getting his mate Rocco to ring her up. Kerry tells Joe off and tells him that it's not a very good joke. MELANIE:(to herself) Just a joke. I'm just a joke.